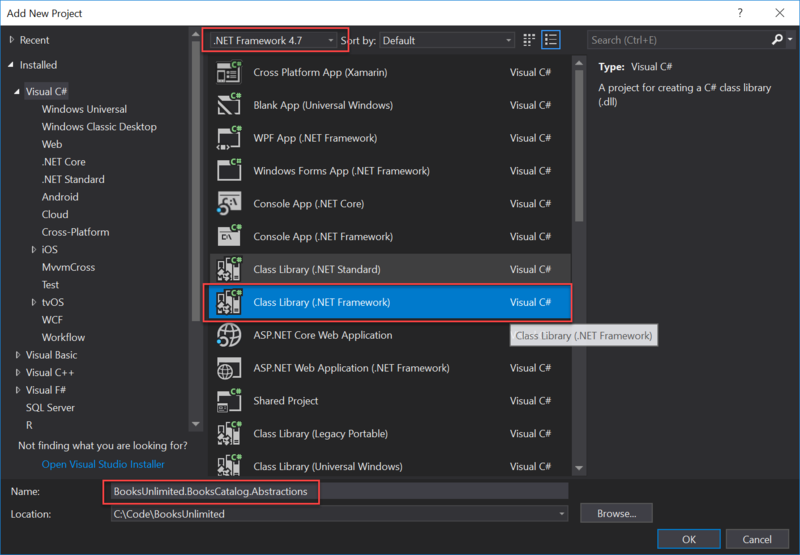 Creating a Service Fabric Service is straightforward with the help of Visual Studio. We will keep the service simple so we can focus on how we would call a SF service from a custom Orchard module. To create a new Service Fabric service, right-click on the Services node of the BooksUnlimited SF project, then click Add -> New Service Fabric Project. 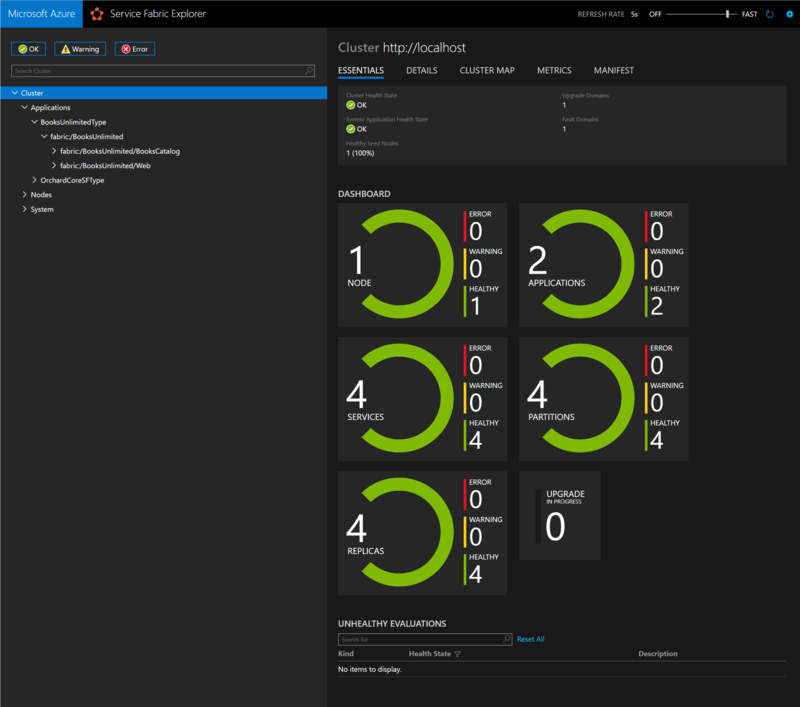 The screen that appears next should look familiar, since we saw this screen when we first created the Service Fabric project and the initial Stateless ASP.NET Core service. This time, we will go with the Stateless Service project template and call it BooksUnlimited.BooksCatalog. /// An instance of this class is created for each service instance by the Service Fabric runtime. /// Optional override to create listeners (e.g., TCP, HTTP) for this service replica to handle client or user requests. A TCP/IP listener that listens on a socket for requests. A service bus listener that listens for message on a queue. In order for our BooksUnlimited.Web application to be able to consume our BooksUnlimited.BooksCatalog service, we could consider exposing a RESTful Web API using ASP.NET Core using a KestrelCommunicationListener as well. However, let's assume that we don't want to expose the service to the outside world, but instead, only allow the web application to consume the service. To achieve that, we need to return an IServiceRemotingListener. We can create an actual instance of such a listener by invoking an extension method called CreateServiceRemotingListener that is provided as part of the Microsoft.ServiceFabric.Services.Remoting package, which you should add now. 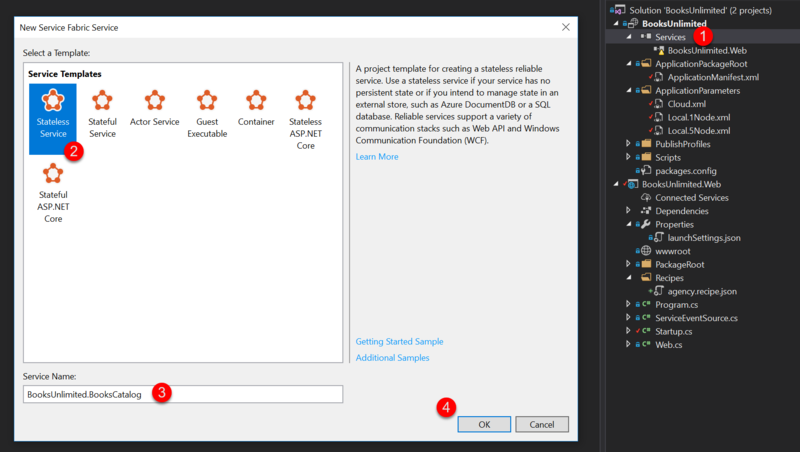 Before we can use the CreateServiceRemotingListener extension method however, we need to create a C# interface that derives from IService (provided by the Remoting package as well). We will call this interface IBooksCatalogService, and will be used by consumers to communicate with the service. Since the IBooksCatalogService interface is to be used by consumrs, we need to create a shared class library that consumers can reference. Because the last thing we want is for our consumers (such as our BooksUnlimited.Web application) to have to reference the SF service project directly. So let's go ahead and create a new class library project called BooksUnlimited.BooksCatalog.Abstractions (make sure this is a Class Library project targeting .NET Framework 4.7 - remember, Service Fabric does not yet fully support .NET Standard 2.0 at the time of this writing). Make sure to add the Microsoft.ServiceFabric.Services.Remoting package to this project as well, since we need to use the IService interface. Notice that the GetBooksAsync method returns a Task, which is required by the Service Fabric Remoting API. Before we continue, let's change the names of our two services to something more pleasingly. Open ApplicationManifest.xml in the BooksUnlimited SF project, and look for the <DefaultServices> element. This is where all of the SF services are listed that are to be deployed as part of the Servie Fabric application. In the next and final part, we will create a custom Orchard module that consumes the service we just created. See you there!